The Hazard and Operability (Hazop) study is a widely used formal technique for examining potential safety and operational problems associated with a system. Isograph’s powerful Hazop+ software can be used to vastly simplify the customizing, recording, managing and reporting processes of the Hazop study. This means a Hazop study can be completed much more quickly and cost-effectively. The HAZOP study is a detailed examination, by a group of specialists, of components within a system to determine what would happen if that component were to operate outside its normal design mode. The effects of such behaviour is then assessed and noted down on study forms. The categories of information entered on these forms can vary from industry to industry and from company to company. Hazop+ operates in an environment that allows full customization. This is reflected in the diversity of industries that are using the program across the globe today, such as Defense, Aerospace, Oil & Gas, Automotive, Chemical Process and Nuclear Power. What's new in 7-th version. 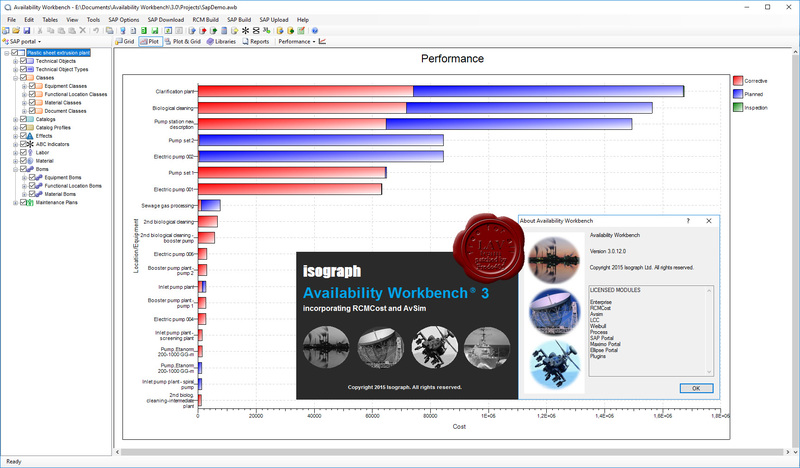 Availability Workbench is flagship suite of availability simulation software. It includes the latest versions of Isograph’s AvSim+ and RCMCost software for system availability simulation and reliability centered maintenance. In addition it includes Weibull Analysis and Life Cycle Costing modules. 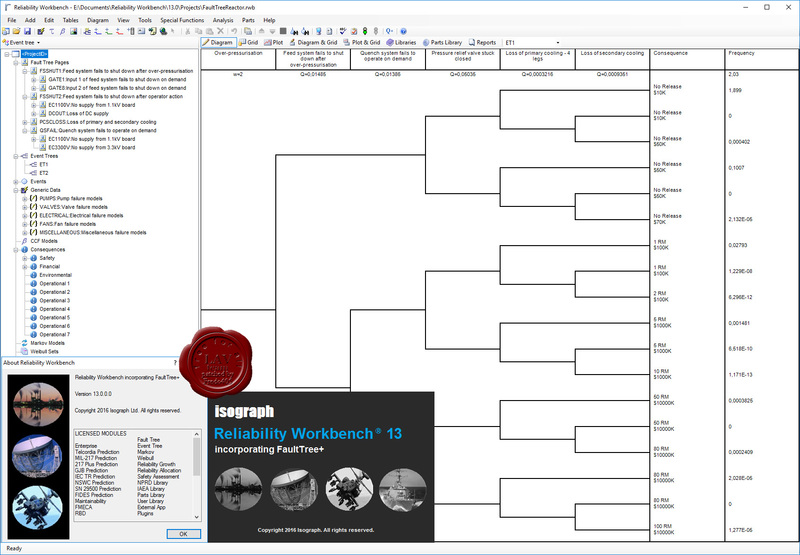 Availability Workbench is used to optimize maintenance and spares policies, predict system availability and throughput and estimate life cycle costs. It includes well known modeling methods such as FMECA, Reliability Block Diagram Analysis and Fault Tree Analysis. Is planned maintenance cost effective? How often should it be performed? What design improvements are cost and safety effective? What is the optimum level of spares to be held on site and at a depot? How can labor and equipment usage be improved? How can buffers best be employed to maintain capacity? How can risk be reduced? What are the likely life cycle costs? What is the best frequency for performing major overhauls? Is predictive maintenance worth doing? How do ageing assets affect life cycle costs? What is the predicted reliability of a system? Which are the critical components in my system? What maintenance or design changes will improve the system reliability? What are the consequences and risks of system failures? Each of the modules is a powerful application in its own right and can be used independently, but more power is gained by the integration of the modules in the application environment The modules can dynamically share data for ease and consistency. Users only need to input data once but can use it several times. The Hazard andOperability (Hazop) study is a widely used formal technique for examiningpotential safety and operational problems associated with a system. 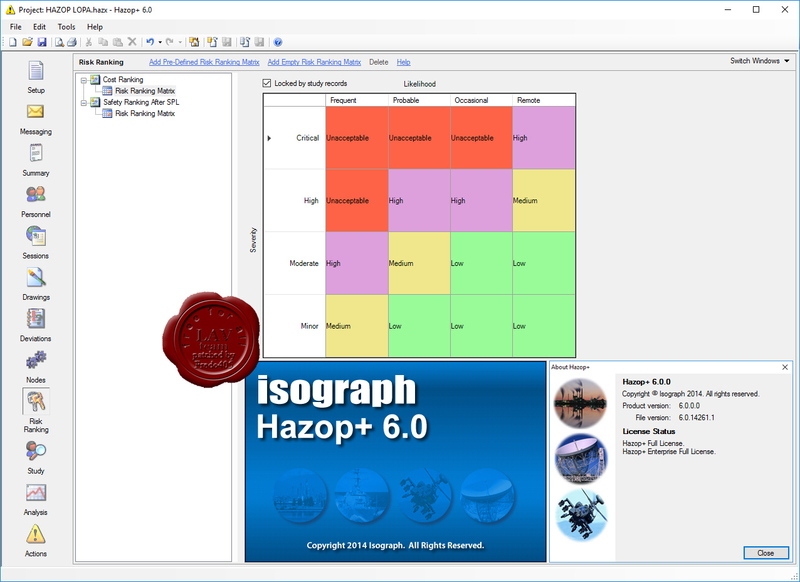 Isograph’s powerful Hazop+ software can be used to vastly simplify thecustomizing, recording, managing and reporting processes of the Hazopstudy. This means a Hazop study can be completed much more quickly andcost-effectively. The HAZOP study is adetailed examination, by a group of specialists, of components within a systemto determine what would happen if that component were to operate outside itsnormal design mode. The effects of suchbehavior is then assessed and noted down on study forms. The categories ofinformation entered on these forms can vary from industry to industry and fromcompany to company. Hazop+ operates in anenvironment that allows full customization. This is reflected in the diversityof industries that are using the program across the globe today, such asDefense, Aerospace, Oil & Gas, Automotive, Chemical Process and NuclearPower.